In space no one can hear you scream... at this damn thing! If you are a collector of all things weird and wonderful, how about adding this to your collection? This quite frankly horrifying creation was NASA's human simulator robot on which to test space suits. Built in 1963, the robot was filled with sensors to see how much pressure the new space suits, created as part of the space race, exerted upon the human body. 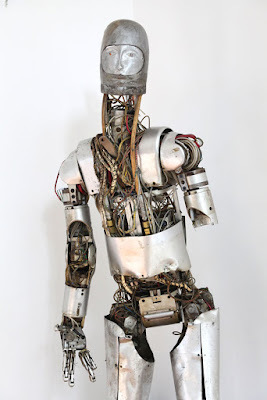 Undeniably eerie, the robot helped NASA to make the suits that were worn by the Apollo 11 astronauts during their mission to the moon, so we should be some way appreciative of the dead-faced, arm-missing creep. If James Cameron had used this as the basis for the Terminator, that film would have been even scarier. On sale at the forthcoming Remarkable Rarities auction, the robot is expected to fetch at least $80,000. You could always use it for Halloween, we suppose.